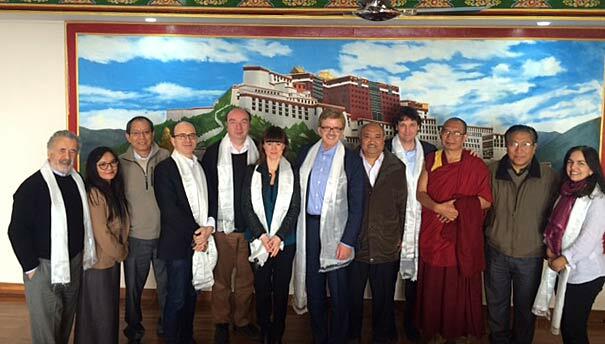 Tibetan Election Observation Mission members with the Tibetan election commissioners in Dharamsala on March 19, 2016. The international community, as reflected through the media coverage, has shown great interest in this Tibetan democratic process. It remains to be seen how the governments will react to the new reality and the new Administration in Dharamsala. There is continued public support whether in the United States, Europe or elsewhere to the just cause of the Tibetan people and the political leadership in all the countries would need to keep this in consideration as they try to frame a new approach to the Tibetan issue. 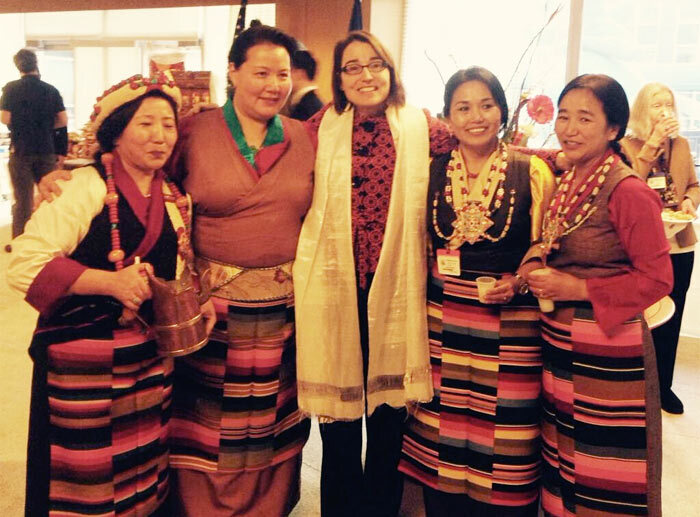 Seven months later, another history was created when on February 24, 2015, Under Secretary Sarah Sewall, in her capacity as the U.S. Special Coordinator for Tibetan Issues, hosted in the State Department a Losar (New Year) to an invited group of Tibetan Americans, diplomats and other guests. As Under Secretary Sewall invited the gathering to join her in saying, “Losar Tashi Delek” one could sense a special emotional feeling among the Tibetan Americans privileged to be participating in the event. Excitement was clearly visible as quite a few of the Tibetan Americans who had come to help serve the traditional Tibetan delicacies and drinks could not resist taking the time to shoot photos, to record the history in the making. Why is the Losar at the State Department significant? As Under Secretary Sewall said at the reception, “Now, one of the amazing things about the Tibetan American community is that in numbers you all… are relatively small, but in your influence, and in your impact, you are enormous.” It heralds virtually a new year for the Tibetan Americans whose existence is increasingly being noticed in the United States. 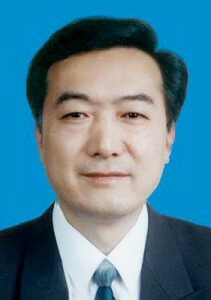 Former Special Envoy of H.H. the Dalai Lama, Gyari Rinpoche, also saw the Losar celebration as an indication of the implementation of the United States’ objective of helping to preserve and promote the distinct Tibetan religious and cultural heritage. As I write this, we are preparing for the next annual Tibet Lobby Day here in Washington, D.C., which will be held on March 2 and 3. This is an event that has seen increasing participation by Tibetan Americans as they go to the offices of their members of Congress and exercise the freedom to express their views on Tibet to them. Henceforth, Losar would not only be an exotic tradition of a people far away in Tibet, but is a Tibetan American culture and thus as American a culture as any other. On December 10, 2014, lovers of peace, friends, well-wishers and followers of His Holiness the Dalai Lama celebrate the 25th anniversary of the bestowal of the Nobel Peace Prize to him. His Holiness is of course is in Rome to participated in the Nobel Peace Laureates Summit, which has now been relocated there. It is a cliché to say what a difference 25 years can make. But in the case of His Holiness the Dalai Lama, these two and a half decades have indeed cemented his place as a statesman and a conscience of the world. Today, the Dalai Lama and peace/compassion have virtually become synonymous. In 1989, I was working in Dharamsala and so was part of the collective Tibetan rejoicing of the event. We, at least I, then interpreted the prize solely in the context of Tibet, and Tibet alone. We saw this as Tibet’s day in the sun. Fast forward to 2014 and I reread His Holiness’ acceptance speech (of December 10, 1989) as well as his Nobel lecture (of December 11, 1989), and the Presentation Speech by Mr. Egil Aarvik, Chairman of the Norwegian Nobel Committee. I now have a fresh perspective of the expanse of the Dalai Lama’s impact. His Holiness’ remarks in Oslo in 1989 appear to me as the germinating ground for the philosophy for which he has become well-known today. This includes his dialogue with the scientific community, his adherence to nonviolence, and, above all, his three main commitments: promotion of human values, promotion of religious harmony and promotion of Tibetan culture. In the Tibetan cultural context, the Dalai Lama is also referred to as Zamling Shidey Depon ( “pilot of world peace”) and he continues to be one today. The Dalai Lama’s stress on the need for religion to have dialogue with science can also be perceived in his Nobel remarks. Today, the Dalai Lama has established a strong foundation for dialogue between religion and science through the Mind & Life initiative. In the process, he has had an impact on the thinking of the scientific community, particularly those working in the field of neuroscience, through his sharing of the Buddhist perspective. I also want to believe that through his Nobel remarks, the Dalai Lama was also crystalizing his now well-known three commitments. In another words, His Holiness was stressing on the fundamental human values that all human beings share. Every November, Americans celebrate a noble occasion, Thanksgiving Day, when we are encouraged “to count our many blessings.” This year Thanksgiving Day falls on November 27, 2014. Since the day comes a few weeks after yet another successful visit by His Holiness the Dalai Lama to the United States (as well as Canada), I want to offer thanks to the democracy and freedom of this country that enables His Holiness to make his visits and the opportunity it provides to Americans to benefit from his wisdom. Although we take visits by the Dalai Lama to the United States for granted today (compared to some other countries that have to capitulate to direct and indirect pressures from China) things were not always that way. His Holiness first began visiting the United States in 1979 but there were efforts many years before that for him to be in this country. 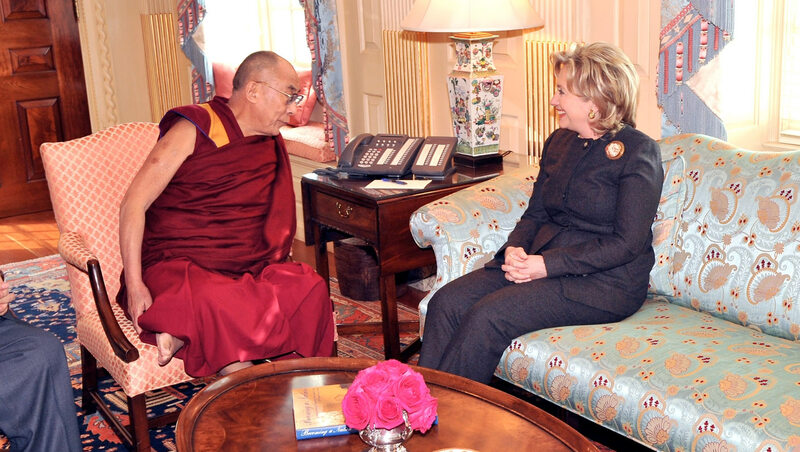 Some recently declassified United States Government documents that include communications exchanged between the White House, the State Department and the United States Embassy in India, way back in 1970, about a possible visit by the Dalai Lama gives us a taste of the decision making process then. Although it is unfortunate that His Holiness had to wait for nine long years following those deliberations, yet it is revealing to see how different organs of the United States Government approached the issue. I summarize below the exchange of memos and cables between the White House, the State Department and the American Embassy in India between March and April 1970. However, Kissinger feels outright rejection is not the right response to the Tibetans and that they should be informed that “The visit would be inconvenient this year but we would wish to consider it seriously in 1971 (after the UNGA session is over).” UNGA is of course the United Nations General Assembly held every autumn in New York attended by many government leaders. When the above guideline was conveyed to the Embassy in India, it responded to the State Department in a telegram dated April 8, 1970 requesting that “The Department revise its position to permit at least a private visit this year.” The Embassy’s view was that not allowing the visit would be seen by both the Tibetans as well as the Indian Government as “appeasing” China. And that was the end of that endeavor, as it turned out to be. Eventually, good sense prevailed in the United States Government, and the Dalai Lama has been able to visit this country many times since 1979. We in the International Campaign for Tibet have been privileged to have been involved in many of these visits. The Dalai Lama’s visits have enabled several thousand Americans to imbibe his message of compassion, peace and non-violence. So, this Thanksgiving Day, I am thankful to His Holiness the Dalai Lama who has been working tirelessly for the past more than seven decades in the service of humanity. I am also thankful to the United States, a country whose adherence to the fundamental values of human rights, democracy, and rule of law continues to provide hope and succor to the Tibetan people, including in giving a sense of belonging to thousands of Tibetan Americans. Now that we have a picture of where the issue of Tibet figured in the summit between President Barack Obama and Chinese President Xi Jinping in Beijing on November 11 and 12, 2014, overall President Obama deserves our commendation. Such a clear outlining of American approach was needed at a time when there are many who feel that the United States is giving into economic consideration by being soft on the fundamental American values of human rights, democracy, and freedom. I have no doubt that President Xi Jinping and the Chinese Government have once again received the message that the American people and government have not slackened off in their support for the rights of the Tibetan people. However, there were people who were perturbed at President Obama saying, “…we recognize Tibet as part of the People’s Republic of China. We are not in favor of independence.” While I would have wished for the President not to have said this, to be fair, recognizing Tibet as a part of the People’s Republic of China is a known American position, and as the Washington Post put in an editorial, “Obama was more diplomatic“ by reiterating it. But of course the Chinese media exploited this by focusing only on it and conveniently neglecting to refer to President Obama’s strong stress on the importance of Tibetan identity. The report from Lhasa about the visit there by the central inspection team and finding corruption at grass roots level, and remarks by the Tibet Autonomous Region Party Secretary Chen Quanguo warning cadres who continue to be loyal to His Holiness the Dalai Lama is interesting in a few ways. It is good that the authorities are finally realizing something that has been an open secret among Tibetans in Tibet for many decades; corruption is rampant and even routine tasks that are expected from any official cannot be performed without going through the Takgo (“back door”). Therefore, finding “serious corruption issues” will not be a surprise to the Tibetans, but they will now be waiting to see how the authorities will be following up on this. Ye is quoted as reiterating that on the issue of anti-corruption campaign, Tibet will not enjoy any special privileges. 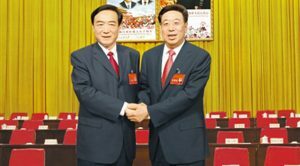 But a belief among the Tibetan public is that the authorities will not be prosecuting any of these officials as they are also the ones who mouth slogans of loyalty to the Chinese Communist Party. So far the trend is for the authorities to specifically reward those officials who are criticized by the public because this was taken as an indication that these officials are upholding party lines (and conversely demote those who are praised by the people). Chen then expands on the situation saying that the anti-corruption campaign should be coordinated with the anti-separatism campaign. He is reported as saying that one hand should uphold the anti-corruption campaign and the other hand should uphold the anti-separatism campaign. Now here comes the interesting part. Chen is reported as saying, “Those cadres and officials who harbor fantasies about the 14th Dalai Clique, follow the 14th Dalai Clique, participate in supporting separatist infiltration sabotage activities will be strictly and severely dealt with according to the law and disciplinary rules.” Chen adds that they should not be Go-nyima (“dual headed”). The findings of China’s inspection team and the admission by Chen Quanguo that even cadres are looking to the Dalai Lama instead of to the Communist Party confirms the reality that despite all their efforts the Chinese authorities have not been successful in severing the historical and special bond between the Tibetan people and the Dalai Lama. But the latest report confirms what the Tibetans knew all along; their steadfast devotion to the Dalai Lama and the existence of corruption at all levels in the Tibetan society in Tibet. The sooner the Chinese Government acknowledges these and positively addresses them, the better it is for China and Tibet.